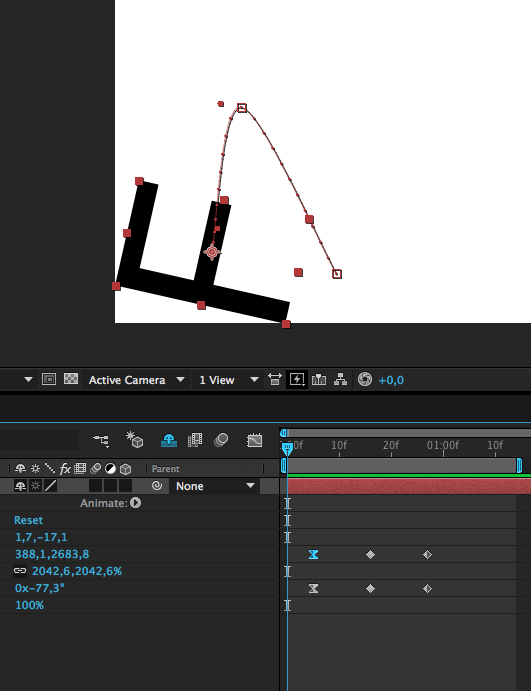 In Adobe After Effects, I am trying to animate a letter first »lying« on the ground, then jumping up and falling down again. I want the animation to look believable, meaning that the jumping and falling animation is somewhat according to how the object would behave under the influence of actual physics. As of right now, my animations look very static and rigid. I'd be great if someone could give me some insight into how I can improve my animation. It's mostly all about timing, falling/moving objects in real life don't just move from A to B in a linear fashion, they accelerate, decelerate, bounce, wobble, overshoot... So you can add in keyframes and adjust your timing to better reflect this (the graph editor is good for this). Search for tutorials on "animate realistic bounce" or something similar for more on creating more realistic movements. (check out the video examples). Newton is a great plugin for creating physics in After Effects; it handles the gravity, collisions, allows you to set friction and bounciness, has a bunch of body types and joints etc. It's pretty easy to work with and has a nice UI and fast preview too. There are other (cheaper) plugins too, but I've only ever used Newton. Just search for "After Effects physics plugin" and see what you like the look of. notice how the characters in your example bounce up and down quite naturally. One thing you can do with your project is add keyframes after what you have so far, and have the character complete a slow rise up back up its original path, and quicker rise down. Add maybe three sets of that motion up and down, each time decreasing range of motion a little more, until it is completely still. Once you have a few seconds, that's when you can fine tune the project a bit more, experimenting with placement of the keyframes until the movement appears natural. Hope that helps! Not the answer you're looking for? Browse other questions tagged animation adobe-after-effects or ask your own question.